(This post contains affiliate links but clicking on them does not change the price for you, but does help offset some operating costs on Tasting Page. Full Disclosure). Staying healthy requires research and work on many fronts. There’s the first step of buying and preparing clean food. I’d like to think that if you’re reading this blog, then you’re well on your way in that category. If you need some help stocking your clean pantry, read this. The next level for optimal health is ensuring that you’re using eco-friendly kitchen products. If you’re already using organic food to reduce your toxin exposure, you also want to make sure that you’re not ingesting chemicals from the products that you use in your kitchen. Sadly, all those plastic containers that we’ve been storing our food in and drinking water out of, include BPA and phthalates. You may not know how to pronounce these words, but I can guarantee that you don’t want to be ingesting them. BPA is found in many plastic water bottles, as well as in canned food. It’s a synthetic hormone that has been linked to breast cancer. Phthalates are no better and can throw your hormones and thyroid out of whack. Then there's the environmental impact of plastic. One water bottle will take hundreds of years to break down. There's also the issues with animals in the water eating the plastic. We then eat the animal, ingesting more plastic! Before you bury your head in the sand, as sometimes I like to do when I hear a lot of bad news, there are some good, eco-friendly kitchen products you can use to minimize your toxin exposure. Here are a few simple swaps to remove the chemicals from your kitchen, while also protecting the environment. When Teflon and other non-stick products came on the market, everyone rejoiced at the ease of these products for effortless cooking. Then came the findings that Teflon, or PTFE, polytetrafluoroethylene, killed pet birds and created flu-like systems in humans. So yeah, there’s that. If you have Teflon pans and you can see scratches with material flaking off, I’d highly recommend discarding the pans. Those chemicals can get in your food and then your body. Don’t worry, there are several green kitchen products that are a much better alternative for healthy cooking. My personal favorite is Xtrema cookware. It’s ceramic, sturdy, and easy to use. I have their 7” and 12” and those two skillets cover most of my cooking needs. You can see the bigger skillet in action in my kale sweet potato skillet recipe pictured above. I’ve never developed a relationship with cast iron, but many people swear by it. There’s the extra step of seasoning and special care that I never got into, but it can have a place in an eco-friendly kitchen, so have a look. My Le Creuset dutch French oven was in fact my actual oven while I lived in Paris. It’s a versatile dish, perfect for soups, stews, chili, and the like. It’s an investment, but it’s a beauty, and a great addition to a green kitchen. So you’re getting rid of your plastic storage containers now that you know about BPA and phthalates. There’s also research that shows even BPA-free containers can still leach chemicals into your food, so I steer clear of all plastics in my kitchen. I will make an exception for a lid of a glass container, but I always hand wash the lid since high temperatures can break down the plastic. My kitchen is full of glass containers. There’s glass pyrex for cooking and storage. I really like the ones that have locking lids like these. I have mason jars everywhere. I put dips, sauces, drinks, nuts, seeds, and leftovers in jars. They store nicely, and you can always see what's inside. You can also wash the glass in the dishwasher without fear of chemical leaching. I hand wash the lids. You also want to ditch the plastic cooking utensils. Warming up plastic is never a good idea. A set of pretty bamboo pieces can be very inexpensive and will last you a lifetime. I’ve had a hard time ditching my paper towels, and to be honest, I still haven’t completely gotten rid of them. BUT, I’ve now been able to cut down on my paper towel use thanks to bamboo perforated towels. As the name suggests, these towels are made from bamboo and are also reusable. You can clean the towel (in the washing machine!) and use it up to 100 times! That’s much better than a single-use paper towel. If you’re having a party, ideally you can use real plates and utensils for your guests. You may not have enough supplies, however, or the party could be an outdoor picnic, so sometimes you need an eco-friendly alternative. You can bet you won’t be using Styrofoam or plastic. Enter bamboo to save the green day again. Forks, knives, and spoons come in a biodegradable, compostable, renewal form like these. There’s also plates and bowls made from bagasse, a natural by-product from sugarcane. And lastly, ditch the red solo cups for a compostable plant-based one made from plants like these. If you’re still using plastic wrap, there’s finally a better eco-friendly alternative – beeswax wrap! This natural wrap comes from organic cotton muslin, coated with sustainably harvested beeswax and jojoba oil. You get the green ingredients, and even better, you can reuse it. Wash with a little soap and water, dry, and you’re ready to wrap again! Ditch your plastic cutting board for a wooden one. Wooden cutting boards are gentler on your knives and don’t have as many issues with germs and bacteria like plastic. 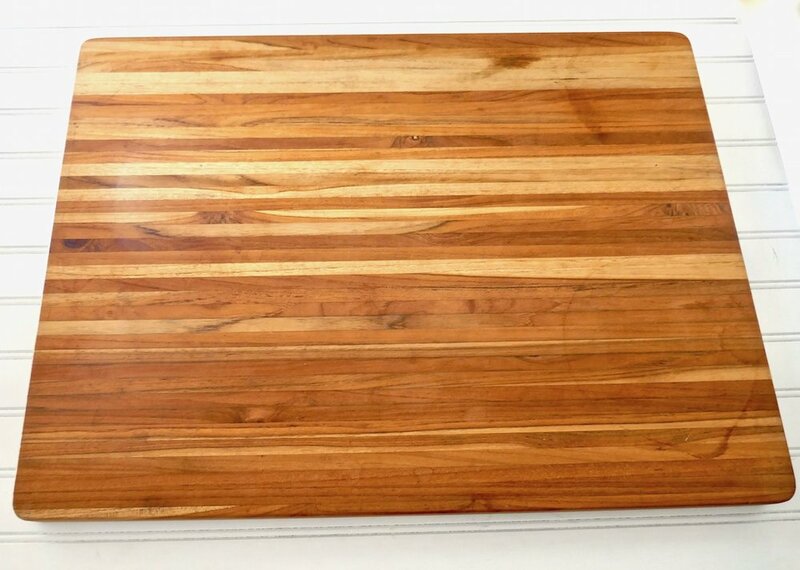 Plus there are some really pretty wooden cutting boards that can look nice in your kitchen, so you don’t constantly have to hide it away. I love this one (pictured above) but there are cheaper alternatives for day to day use. An easy eco-friendly kitchen swap is to ditch the one-time use paper cupcake wrappers for a reusable silicone-baking cup. I have them in different sizes for muffin recipes as well as smaller ones for little bites like my chocolate blueberry nut clusters. Ditch plastic drinking straws and replace them with stainless steel straws. Not only will this healthy swap protect the environment from waste, you also won’t be sucking on plastic while drinking your favorite beverage. I always start my day with warm lemon water and these stainless steel straws also protect my teeth from the acid in the lemon. That’s a lot of wins. Last but not least, make sure that you’re using an eco-friendly cleaning product in your kitchen. Don’t let toxins come into the kitchen when you’re trying to tidy up. You can make your own green cleaning product with a little diluted white vinegar, water, and lemon, or buy from a trusted brand like Seventh Generation or Dr. Bronner. You can also read about castile soap here, the easiest DIY cleaning product that has oh so many uses. What do you do to keep your kitchen eco-friendly?